It was the era of Hawke and Keating, Kylie and INXS, the America's Cup and the Bicentenary. It was perhaps the most controversial decade in Australian history, with high-flying entrepreneurs booming and busting, torrid debates over land rights and immigration, the advent of AIDS, a harsh recession and the rise of the New Right. It was a time when Australians fought for social change - on union picket lines, at rallies for women's rights and against nuclear weapons and as part of a new environmental movement. And then there were the events that left many scratching their heads: Joh for Canberra...the Australia Card...Cliff Young. 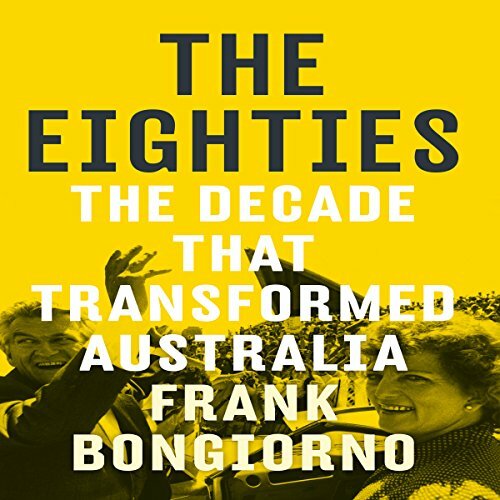 In The Eighties, Frank Bongiorno brings all this and more to life. He uncovers forgotten stories - of factory workers proud of their skills who found themselves surplus to requirements; of Vietnamese families battling to make new lives for themselves in the suburbs. He sheds new light on 'both the ordinary and extraordinary things that happened to Australia and Australians during this liveliest of decades'. The Eighties is contemporary history at its best.